Kent batsman Sam Northeast says becoming vice-captain will allow him to get an idea of whether he wants to lead the side in the future. 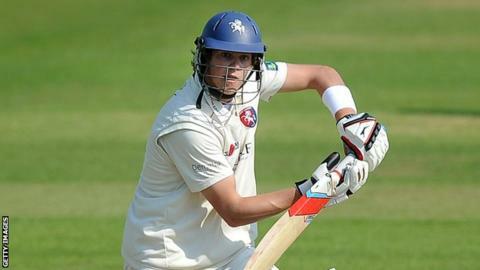 The 24-year-old was appointed to the role last week as Rob Key took over as skipper from James Tredwell. "It is a nice role for me to learn and get experience. I'll see if I want to do it in the future and if I am any good at it," he told BBC Radio Kent. "My thought is to learn as much as possible and play my best cricket." He added: "I'll leave all the nitty-gritty up to Rob. It is exciting and there is a bit of a challenge ahead for sure." Northeast, who made his first-class debut for Kent in 2007, hopes more young players will be able to make an impact for the county in the first team. "It is an exciting challenge for both of us to hopefully bring forward some talented youngsters and potentially set a few principles in place to really go forward in the next two or three years," Northeast said. "I'll have an input as part of a cricket management group. We are all putting our input in to the future and our opinions of how we will take the culture forward and all sorts. "Jimmy [Kent coach Jimmy Adams] and Keysy are accountable for a lot so it will be up to them to define how things are going forward. "In general we want to raise the standard. "With guys coming through we want them to not just play for Kent but be the level where we want them to start knocking on England Lions doors and stuff. "If people are coming through then great and in two or three years then we have a group of players that can really challenge for titles or whatever." Northeast scored 650 runs at an average of 26 in the County Championship last season and is also hoping the responsibility of the vice-captaincy will improve his own game. "Hopefully I can mature as a person and a player," he said. "Hopefully it can bring me on and spur me to become a really top player. Time will tell. I don't see it as a hindrance, that's for sure. "Come your late 20s you can find your best form. I didn't have a great year last year but I can bounce back and really push. "I still think I have got a lot to offer and a lot to improve."